TS ECET Results 2018 – Manabadi TSECET Result, Rank Card, Counselling Dates on 24th May, 2018 : తెలంగాణా ఈసెట్ 2018 ఫలితాలు విడుదల ఈరోజు (24TH May, 2018). 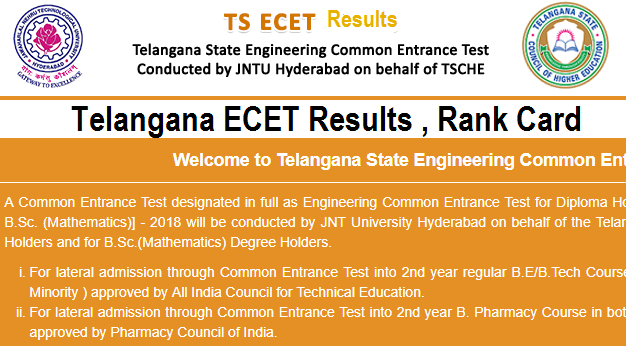 TS ECET Results 2018 – Manabadi Telangana ECET Result, Rank Card Download @ ecet.tsche.ac.in. TSECET Results 2018 will be declared on 24.05.2018 by Honorable Minister for HRD, Sri Kadiyam Srihari at 04 PM in Hyderabad. Telangana ECET Examination result with marks and score will be available at official website ecet.tsche.ac.in. Students can download their Manabadi TS ECET Result and Rank card from schools9, indiaresults websites. TS ECET Result 2018 is announcing on 24th May 2018. The results can be viewed from the website through online mode. Candidates those who successfully given the written entrance exam can download the result. Candidates can also get the answer key from ECET Official website. The answer key will be displayed stream-wise. Qualified candidates will be called for counselling session which is conducted on the merit basis. How To Download TS ECET Results 2018 ? TS ECET results 2018 declared 24th May, 2018. TS ECET 2018 Manabadi Results Telangana ECET 2018 Ranks, Counselling Dates @ ecet.tsche.ac.in. Sir, kya aap counselling ki dates ke bare me bata sakte hain. TS ECET Result had been declared. Are the counselling dates has been released. If it is so, then please notify.